Citation Information: JCI Insight. 2018;3(4):e93029. https://doi.org/10.1172/jci.insight.93029. Traditional pulmonary therapies for cystic fibrosis (CF) target the downstream effects of CF transmembrane conductance regulator (CFTR) dysfunction (the cause of CF). Use of one such therapy, β-adrenergic bronchodilators (such as albuterol), is nearly universal for airway clearance. Conversely, novel modulator therapies restore function to select mutant CFTR proteins, offering a disease-modifying treatment. Recent trials of modulators targeting F508del-CFTR, the most common CFTR mutation, suggest that chronic β-agonist use may undermine clinical modulator benefits. We therefore sought to understand the impact of chronic or excess β-agonist exposure on CFTR activation in human airway epithelium. The present studies demonstrate a greater than 60% reduction in both wild-type and modulator-corrected F508del-CFTR activation following chronic exposure to short- and long-acting β-agonists. This reduction was due to reduced cellular generation of cAMP downstream of the β-2 adrenergic receptor–G protein complex. Our results point towards a posttranscriptional reduction in adenylyl cyclase function as the mechanism of impaired CFTR activation produced by prolonged β-agonist exposure. β-Agonist–induced CFTR dysfunction was sufficient to abrogate VX809/VX770 modulation of F508del-CFTR in vitro. Understanding the clinical relevance of our observations is critical for CF patients using these drugs, and for investigators to inform future CFTR modulator drug trials. Citation Information: JCI Insight. 2018;3(4):e94679. 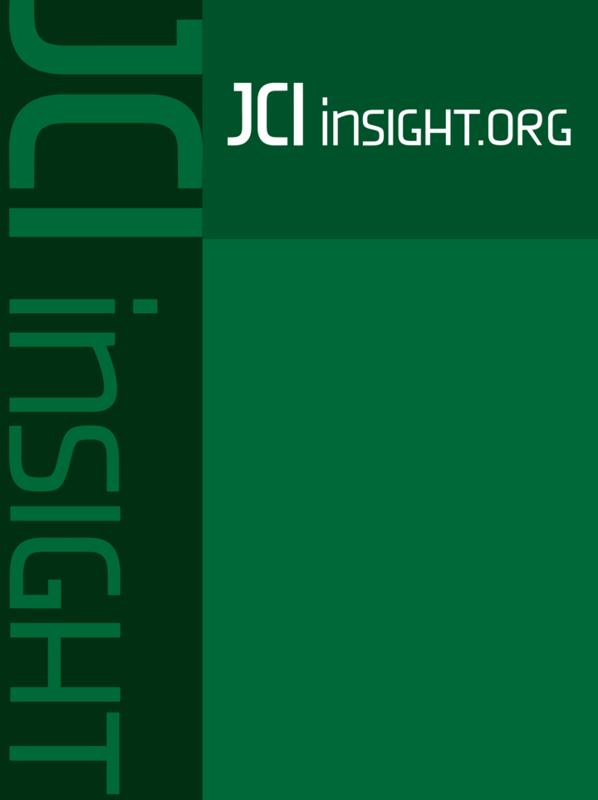 https://doi.org/10.1172/jci.insight.94679. Mutations in KIT and TET2 are associated with myeloid malignancies. We show that loss of TET2-induced PI3K activation and -increased proliferation is rescued by targeting the p110α/δ subunits of PI3K. RNA-Seq revealed a hyperactive c-Myc signature in Tet2–/– cells, which is normalized by inhibiting PI3K signaling. Loss of TET2 impairs the maturation of myeloid lineage–derived mast cells by dysregulating the expression of Mitf and Cebpa, which is restored by low-dose ascorbic acid and 5-azacytidine. Utilizing a mouse model in which the loss of TET2 precedes the expression of oncogenic Kit, similar to the human disease, results in the development of a non–mast cell lineage neoplasm (AHNMD), which is responsive to PI3K inhibition. Thus, therapeutic approaches involving hypomethylating agents, ascorbic acid, and isoform-specific PI3K inhibitors are likely to be useful for treating patients with TET2 and KIT mutations. Citation Information: JCI Insight. 2018;3(4):e94952. https://doi.org/10.1172/jci.insight.94952. Citation Information: JCI Insight. 2018;3(4):e96940. https://doi.org/10.1172/jci.insight.96940. Recipient endogenous memory T cells with donor reactivity pose an important barrier to successful transplantation and costimulatory blockade–induced graft tolerance. Longer ischemic storage times prior to organ transplantation increase early posttransplant inflammation and negatively impact early graft function and long-term graft outcome. Little is known about the mechanisms enhancing endogenous memory T cell activation to mediate tissue injury within the increased inflammatory environment of allografts subjected to prolonged cold ischemic storage (CIS). Endogenous memory CD4+ and CD8+ T cell activation is markedly increased within complete MHC-mismatched cardiac allografts subjected to prolonged versus minimal CIS, and the memory CD8+ T cells directly mediate CTLA-4Ig–resistant allograft rejection. Memory CD8+ T cell activation within allografts subjected to prolonged CIS requires memory CD4+ T cell stimulation of graft DCs to produce p40 homodimers, but not IL-12 p40/p35 heterodimers. Targeting p40 abrogates memory CD8+ T cell proliferation within the allografts and their ability to mediate CTLA-4Ig–resistant allograft rejection. These findings indicate a critical role for memory CD4+ T cell–graft DC interactions to increase the intensity of endogenous memory CD8+ T cell activation needed to mediate rejection of higher-risk allografts subjected to increased CIS. Citation Information: JCI Insight. 2018;3(4):e97919. https://doi.org/10.1172/jci.insight.97919. Neurodegeneration is a central aspect of the early stages of diabetic retinopathy, the primary ocular complication associated with diabetes. While progress has been made to improve the vascular perturbations associated with diabetic retinopathy, there are still no treatment options to counteract the neuroretinal degeneration associated with diabetes. Our previous work suggested that the molecular chaperones α-crystallins could be involved in the pathophysiology of diabetic retinopathy; however, the role and regulation of α-crystallins remained unknown. In the present study, we demonstrated the neuroprotective role of αA-crystallin during diabetes and its regulation by its phosphorylation on residue 148. We further characterized the dual role of αA-crystallin in neurons and glia, its essential role for neuronal survival, and its direct dependence on phosphorylation on this residue. These findings support further evaluation of αA-crystallin as a treatment option to promote neuron survival in diabetic retinopathy and neurodegenerative diseases in general. Citation Information: JCI Insight. 2018;3(4):e98006. https://doi.org/10.1172/jci.insight.98006. Lipids in the stratum corneum of atopic dermatitis (AD) patients differ substantially in composition from healthy subjects. We hypothesized that hyperactivated type 2 immune response alters AD skin lipid metabolism. We have analyzed stratum corneum lipids from nonlesional and lesional skin of AD subjects and IL-13 skin-specific Tg mice. We also directly examined the effects of IL-4/IL-13 on human keratinocytes in vitro. Mass spectrometric analysis of lesional stratum corneum from AD subjects and IL-13 Tg mice revealed an increased proportion of short-chain (N-14:0 to N-24:0) NS ceramides, sphingomyelins, and 14:0–22:0 lysophosphatidylcholines (14:0–22:0 LPC) with a simultaneous decline in the proportion of corresponding long-chain species (N-26:0 to N-32:0 sphingolipids and 24:0–30:0 LPC) when compared with healthy controls. An increase in short-chain LPC species was also observed in nonlesional AD skin. Similar changes were observed in IL-4/IL-13–driven responses in Ca2+-differentiated human keratinocytes in vitro, all being blocked by STAT6 silencing with siRNA. RNA sequencing analysis performed on stratum corneum of AD as compared with healthy subjects identified decreased expression of fatty acid elongases ELOVL3 and ELOVL6 that contributed to observed changes in atopic skin lipids. IL-4/IL-13 also inhibited ELOVL3 and ELOVL6 expression in keratinocyte cultures in a STAT6-dependent manner. Downregulation of ELOVL3/ELOVL6 expression in keratinocytes by siRNA decreased the proportion of long-chain fatty acids globally and in sphingolipids. Thus, our data strongly support the pathogenic role of type 2 immune activation in AD skin lipid metabolism. Citation Information: JCI Insight. 2018;3(4):e98045. https://doi.org/10.1172/jci.insight.98045. BACKGROUND. Subspecies of HDL contain apolipoprotein E (apoE) and/or apoCIII. Both proteins have properties that could affect HDL metabolism. The relation between HDL metabolism and risk of coronary heart disease (CHD) is not well understood. METHODS. Eighteen participants were given a bolus infusion of [D3]L-leucine to label endogenous proteins on HDL. HDL was separated into subspecies containing apoE and/or apoCIII and then into 4 sizes. Metabolic rates for apoA-I in HDL subspecies and sizes were determined by interactive modeling. The concentrations of apoE in HDL that contain or lack apoCIII were measured in a prospective study in Denmark including 1,949 incident CHD cases during 9 years. RESULTS. HDL containing apoE but not apoCIII is disproportionately secreted into the circulation, actively expands while circulating, and is quickly cleared. These are key metabolic steps in reverse cholesterol transport, which may protect against atherosclerosis. ApoCIII on HDL strongly attenuates these metabolic actions of HDL apoE. In the epidemiological study, the relation between HDL apoE concentration and CHD significantly differed depending on whether apoCIII was present. HDL apoE was associated significantly with lower risk of CHD only in the HDL subspecies lacking apoCIII. CONCLUSIONS. ApoE and apoCIII on HDL interact to affect metabolism and CHD. ApoE promotes metabolic steps in reverse cholesterol transport and is associated with lower risk of CHD. ApoCIII, when coexisting with apoE on HDL, abolishes these benefits. Therefore, differences in metabolism of HDL subspecies pertaining to reverse cholesterol transport are reflected in differences in association with CHD. TRIAL REGISTRATION. Clinicaltrials.gov NCT01399632. FUNDING. This work was supported by NIH grant R01HL095964 to FMS and by a grant to the Harvard Clinical and Translational Science Center (8UL1TR0001750) from the National Center for Advancing Translational Science. Citation Information: JCI Insight. 2018;3(4):e99816. https://doi.org/10.1172/jci.insight.99816.